I love textiles, created and discovered, gardens and landscapes in this country. 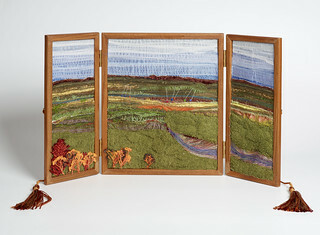 The concept behind this embroidered triptych is an essence of spiritual, with a hint of the medieval. Outside, the cloth is richly coloured with subtle patterns. Inside, a Norfolk coastal landscape, big sky and low lying salt marshes.